Few asset classes have garnered more attention over the past fifteen years than emerging markets. The asset class rose from relative obscurity in the 1980s and 1990s to become one of the trendiest, highest flying areas of the market in the early 2000s only to collapse back to earth in subsequent years. While emerging markets equities may well deserve a place in client portfolios, some of the most commonly cited reasons to own emerging markets do not hold up to empirical evidence. Myth One – Emerging markets are attractive due to higher than average GDP growth rates. Academics have researched the correlations between high GDP growth and equity returns in great depth, and the results are surprising. In 2002, three London Business School professors released an outstanding book entitled Triumph of the Optimists. One of the themes of the book is that there is effectively no correlation at all between a country’s high growth rate and its equity returns. In fact, the correlation is virtually zero. Furthermore, the real returns of the lowest growth countries are virtually even with the returns of the highest countries over the past 45 years. There may be excellent reasons to invest in emerging markets, but higher GDP growth is not one of them. Myth Two – Emerging market equities offer superior risk, return and diversification benefits. 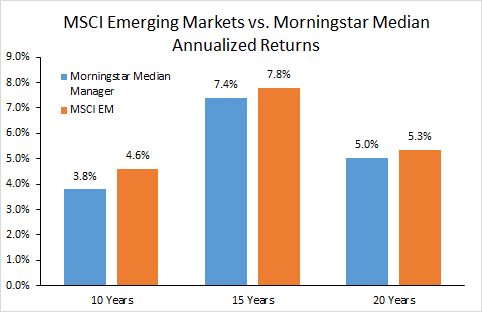 As the following graph illustrates, U.S. stocks and emerging markets had almost identical returns over the 30-year period since EM’s inception in 1988. However, when a measure of risk (volatility) is incorporated in the right-hand axis, the risk in EM has been almost 70% higher. Thus, to generate approximately the same return investors have had to commit to much greater volatility. Another factor investors consider when investing in developing countries is the diversification benefit. When emerging markets were launched in 1988 their correlation to U.S. stocks could often be under 50%, which is advantageous. 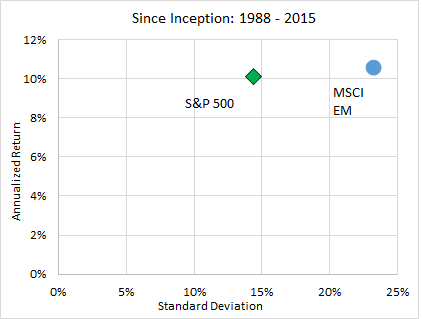 However, over the past fifteen years the correlation between the MSCI EM and the S&P 500 has averaged 70%. In an overall portfolio, there isn’t a large diversification benefit from owning an asset class with a 70% correlation to the S&P 500, especially one with 70% higher volatility. Myth Three – Emerging markets offer investors much greater inefficiencies and, consequently, an easier road to outperformance. Many investors are attracted to emerging markets equities due to their perceived inefficiencies. The index is large and the dissemination of information among investors is not nearly as tight and pervasive as it is in the developed world. Consequently, emerging markets must provide tremendous opportunities for stock pickers or fundamental based investors. However, the data seems to suggest that the opposite may be true. As the graph above shows, the median EM manager trails the MSCI EM Index for all time periods shown from ten to twenty years. Additionally, the spread between the twenty-fifth percentile and the seventy-fifth percentile of funds is less than two percent. In the case of emerging markets, not only does the average manager tend to under-perform, but the spread between the best and the worst performers is tight. Thus, there is a lower probability of selecting individual managers that outperform, and if managers do generate outperformance, it will likely be by a small amount. Myth Four – Emerging market equities offer investors compelling opportunities to capitalize on investment fundamentals. While the underlying fundamentals play an important role over the long term, we have observed that macroeconomic and technical factors can dominate returns in the short to medium term. 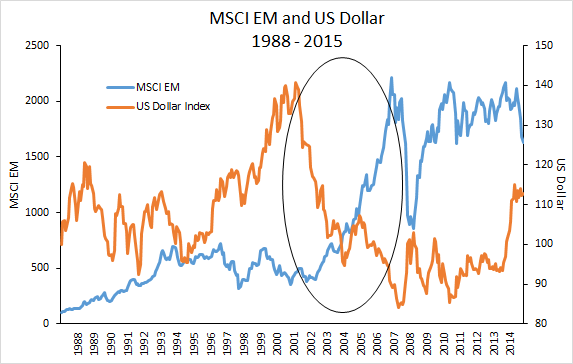 As you’ll note in the graph below, there is an inverse relationship between the U.S. dollar and EM equities. Significantly, there has not been a single sustained period in history since the inception of the MSCI EM when emerging market equities have outperformed in a strong dollar environment. In addition to the U.S. dollar direction, emerging market equities seem to be greatly influenced by U.S. retail investor mutual fund cash flows. It’s important to remember that in almost all emerging markets there is a distinct lack of a domestic investing class. Consequently, that leaves developing countries enormously vulnerable to the cash flow decisions of foreign investors. Starting in 1996, every single sharp drawdown in emerging market equities has been accompanied by selling by foreign investors. The relationship between EM mutual fund cash flows and investment performance at times is so strong that it’s led us to believe that emerging market equity performance can be much more technical in nature, i.e. dependent on fund flows, than fundamental, i.e. the growth in a company’s earnings per share. Multi-nationals in emerging markets — a better alternative? While institutional investors were denied the opportunity to invest broadly in emerging markets until 1988, individual western companies have been building their businesses in the developing world for over one hundred years. Nestlé, Colgate-Palmolive and Unilever, all well-known multi-national companies, share an extensive history in virtually every corner of the developing world and these companies now receive more than 50% of their sales from emerging markets, effectively rendering them as de facto emerging market companies. All three companies show considerable outperformance when compared to the MSCI EM Index. Colgate’s return is almost 40x, while Nestlé and Unilever have returned close to 25x. 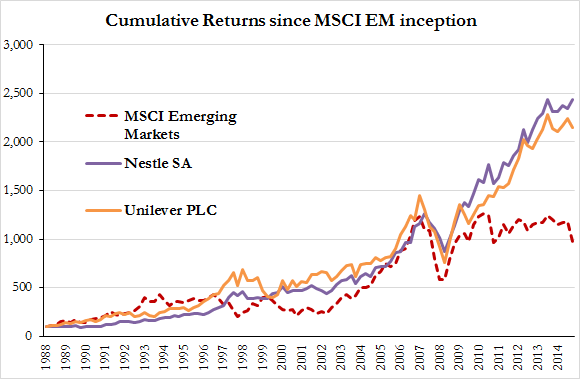 The MSCI EM Index has had credible performance during this period, returning almost 11% and producing a cumulative return of almost 10x. Investor’s often overlook investing in something as sleepy as Colgate-Palmolive – after all finding the next hot company in Burkina Faso is much more exciting. However, it’s difficult to deny that compounding shareholder returns at 11% – 15% for almost forty years is compelling, and it’s led to substantial cumulative returns. We are certainly not writing to recommend that investors shed themselves of emerging market holdings at this point in time. That decision would be too easy. Flows out of EM funds were dramatic last year and the U.S. Dollar has displayed unprecedented strength in the past eighteen months, appreciating against virtually every currency in the EM world. As discussed, EM equities are enormously vulnerable to these two macro trends and, having suffered through a rough patch of performance, you’d have to think the dollar will eventually reverse its course and fund flows will once again become positive. While we are not certain of the timing of these dynamics, we are certain they will happen, as they’ve never not happened, and investors will once again see out-sized returns. Instead, we believe investors should focus on owning the right type of emerging market equities. The reason that Colgate, Nestlé, and Unilever have performed so well for such a long-time is that they are consumer product companies capitalizing upon opening new markets, which are dependent upon per capita income growth. It is our opinion that easily the greatest strength of the developing world is rising annual incomes. It is stunningly powerful and should continue for decades in its determined march upward. The demographic advantages present in emerging markets are massive and will provide investors with substantial opportunities over the next three decades. Utilizing an approach that combines multi-national American and European companies with emerging market managers capitalizing upon these local consumer trends makes sense. While the history of emerging markets has been modestly disappointing, it hasn’t been a failure and now, certainly, is not the right time to exit. Additionally, the performance of large multi-national companies benefiting from their presence in the developing world has been spectacular – the blueprint for success is clearly there.